December 21, 2010 (KHARTOUM) – A secret meeting was held last week in the Israeli capital Tel Aviv between the Russian envoy to Sudan, Mikhail Margelov, and officials from South Sudan, according to an Israeli media source. The IzRus website, a key Russian-language online outlet based in Israel, reported on 16 December that Margelov had absconded briefly in Tel Aviv, where he was on a six-day official visit, in order to meet representatives of South Sudanese government who were in Israel at the time. According to the website, which is cited as one of Israel’s five leading Russian-language websites, Margelov skipped an appointment with Israeli foreign ministry officials in the morning of 16 December and went to meet south Sudanese officials. The website, which is edited by Michael Falkov who previously served between 2003 and 2004 as a media advisor for Israeli foreign minister Avigdor Lieberman, claimed that the covert meeting was related to the referendum vote on South Sudan independence. The semi-autonomous region of South Sudan, where the majority of the population follows Christianity and traditional beliefs, is preparing to gain full independence from the largely Muslim-Arab north in a referendum vote set to take place in January, 9 2011. The plebiscite is the centerpiece of the 2005’s Comprehensive Peace Agreement which ended nearly half a century of intermittent civil war between north and south Sudan. Margelov, who also heads the Russian Federation Council’s Committee for International Affairs, was named as his country’s special envoy to Sudan in December 2008, and has ever since visited the country on several occasions. Earlier this year, Margelov draw the ire of southern Sudanese when he warned of the failure of a new state in south Sudan and expressed fears of a new Somalia emerging in the region. "We as an international community and countries that are permanent Security Council members do not want a new Somalia in South Sudan," he said. The Russian envoy also supported the re-election of President Al-Bashir in April disputed elections, and opposed legal actions taken by the International Criminal Court (ICC) against Al-Bashir. December 8, 2010 (WASHINGTON) – The Russian government informed Sudan that it is prepared to help it obtain debt relief from external creditors, its special said today. "Sudan is a friendly country, and Russia is ready to consider positively the problem of Sudan’s debt, and also to raise the question of cancelling Sudan’s debt to the international community," Russian special envoy to Sudan Mikhail Margelov told Russian news agency (RIA Novosti). The International Monetary Fund (IMF) puts Sudan’s external debts at about $35.7 billion, of which less than half is the original amount borrowed and the rest is divided between interest and late payment penalties. According to IMF, the figure is projected to reach $37.8 billion in 2010. Sudan has long complained that political discord with the West has prevented it from joining the debt relief program known as the Heavily Indebted Poor Countries (HIPC). The news agency said that Sudan’s debt to Russia is between 5 and 10m dollars. The bulk of it, according to the envoy, is "irrevocable". The Russian envoy said that his country is interested in pursuing development opportunities in North and South after the latter has its self-determination referendum next month. "After the referendum in South Sudan in January 2011, Russia is interested in seeing possibilities for economic development emerging both in the south and north of Sudan, and so we will have to discuss the question of lifting the embargo imposed on the country and restrictions on economic projects in Sudan," Margelov said. He said Russia would support any decision taken by the people of South Sudan in the referendum. "Russia supports the referendum in South Sudan, in full compliance with the Comprehensive Peace Agreement through democratic procedures, confirmed by international observers," he added. He noted that Russia’s position on this issue is shared by all member states of the UN Security Council (UNSC). On Wednesday, Margelov met with Sudanese president Omer Hassan Al-Bashir who expressed gratitude to Russia’s stances towards his country. The Sudanese leader briefed the Russian envoy on preparations for the referendum. Margelov conveyed a letter from Russian president Dmitry Medvedev setting out Russia’s assessment on the preparations underway for the 2011 referendum. "The guiding line in our policy on Sudan and the region in general is that of respect for Sudan’s sovereignty and territorial integrity. At the same time, we think it a matter of principle importance that the parties within Sudan itself, seeking to end the long-running armed conflict, stated in the Comprehensive Peace Agreement signed on January 9, 2005, that Southern Sudan will have the right to hold a referendum on self-determination," the letter read according to RIA Novosti. "I am deeply convinced that, whatever the result of the plebiscite, it will not only determine the fate and status of South Sudan and its population, but will have a significant impact on the general political situation in the region. I hope that the outcome of the referendum will provide necessary conditions for the continuation of the post-conflict settlement and further sustainable development of Sudan," Medvedev said. "Russia will continue to provide support for your country. We intend to continue to take steps in bilateral and multilateral formats, in order to develop relations of equal and mutually beneficial cooperation with friendly Sudan. I am convinced that Russian-Sudanese cooperation in international affairs will continue to serve as a factor in strengthening peace, security and stability, especially in this vast region of Northeast Africa," Medvedev stressed. Medvedev further informed Bashir that he will send helicopters for the United Nations mission in South Sudan. "In response to a request by the UN secretary-general, I have decided to relocate a Russian aviation group, which previously operated as part of the UN Mission in Chad and Central African Republic, to the UNMIS, to replace a similar Indian contingent. I hope that our helicopter units will be efficient in the preparation and holding of the referendum". Dmitry Medvedev sent a message to President of the Republic of Sudan Omar Bashir setting out Russia’s assessment of the processes taking place in Sudan in the run-up to the January referendum on the status of the country’s southern regions. “The guiding line in our policy on Sudan and the region in general is that of respect for Sudan’s sovereignty and territorial integrity. At the same time, we think it a matter of principle importance that the parties within Sudan itself, seeking to end the long-running armed conflict, stated in the Comprehensive Peace Agreement signed on January 9, 2005, that Southern Sudan will have the right to hold a referendum on self-determination. It is my firm conviction that no matter what this referendum’s result, it will not only determine the future of Southern Sudan and its people, but will have a substantial influence on the general political situation in the region. I hope that the referendum will produce a result making it possible to establish the conditions necessary for continuing the post-conflict settlement process and ensuring Sudan’s sustainable development. In this respect I think it especially important that both parties to the Comprehensive Peace Agreement make maximum efforts to rapidly draft and implement the needed agreements and practical measures for holding a properly organised and timely referendum. The UN peacekeeping mission in Sudan has a big supporting role to play in this process. In order to provide the necessary assistance, I have decided, in response to a request from the UN Secretary-General, that a Russian aviation contingent previously operating as part of the UN mission in Chad and the Central African Republic will be redeployed to the UN mission in Sudan to replace an equivalent Indian contingent. I hope that our helicopter units will make an effective contribution to the referendum’s preparation and organisation. Furthermore, in response to Sudanese wishes, Russian observers will take part in the referendum’s international monitoring. As I said during our recent conversation, Russia will continue to support your country. We will continue to work in multilateral and bilateral format to develop relations based on equal and mutually advantageous cooperation with friendly Sudan. I am sure that Russian-Sudanese cooperation in international affairs will continue to help strengthen peace, stability and security, above all across the Northeast African region”. Mr Medvedev’s message was delivered to the Sudanese President by Mikhail Margelov, special Russian Federation presidential envoy for Sudan and chairman of the Federation Council’s Committee for International Affairs, who is currently in Sudan on a working visit. (Khartoum, Sudan) - Head of the National Assembly External Relations Committee, Mahdi Ibrahim, Sunday discussed with the Russian delegation, led by the special envoy of the Russian President, progress of south Sudan referendum, Darfur peace strategy and the Sudanese - Russian ties. Ibrahim has appreciated firmness of the bilateral relations between Sudan and Russia, and the role of Russia in the world peace and its stand alongside Sudan at the international arenas. He expressed wishes for further progress of cooperation between Sudan and Russia so that Sudan becomes real partner to Russia in all fields. 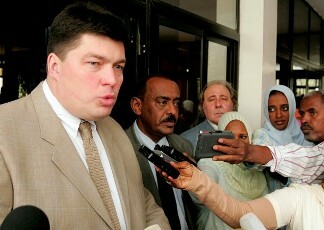 The Head of the Russian delegation said that his country is deeply concerned with Sudan's stability and welfare. MOSCOW, Russia, November 1, 2010/African Press Organization (APO)/ — Dmitry Medvedev and Omar Bashir discussed reconciliation in Sudan on the eve of a historically important stage in the nation’s development – Southern Sudan’s referendum on independence, scheduled for early January 2011. The President of Sudan gave a positive assessment of Russia’s efforts to promote finding a resolution to existing problems. In turn, Dmitry Medvedev emphasised Russia’s readiness to continue working actively with Sudan within the framework of the international community’s efforts, which must be impartial, well-balanced, and based on constructive cooperation with Khartoum. At the same time, Mr Medvedev noted that timely elections serve the long-term interests of Sudan and the entire region, and in this regard, supported Omar Bashir’s repeated statements about holding the referendum as scheduled. During the conversation, the presidents expressed their support for strengthening trade and economic ties between their nations and discussed specific areas for this kind of cooperation. (Khartoum) - Russia has confirmed its participation in the International Donors Conference for Development in East Sudan, scheduled for early next December in Kuwait. 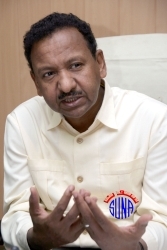 The confirmation of Russia in the conference was expressed by the Ambassador of Russia to Sudan when he was received Thursday by the Presidential Advisor, Dr. Mustafa Osman Ismail [pictured above]. Meanwhile, Dr. Ismail has appreciated the stances of Russia in supporting Sudan at all fields. The Russian Ambassador conveyed to Dr. Ismail a message from the Russian Foreign Minister affirming his country's participation at East Sudan Development Conference in Kuwait. Southern Sudan, which is scheduled to hold a referendum in January on whether to secede from Sudan, is acquiring 10 Russian helicopters that give the semi- autonomous region its first aerial capability. The Sudanese government has been informed about the purchases and told that the aircraft are for civilian purposes, said al-Sawarmi Khaled, spokesman for Sudan’s army. The region’s ruling Sudan People’s Liberation Movement “has confirmed that they’re for transport use,” Khaled said by phone from Khartoum on Aug. 30. Rebels in Southern Sudan and the Sudanese government signed a Comprehensive Peace Agreement, or CPA, in 2005 that ended a conflict in which 2 million people died. The political wing of the Sudan People’s Liberation Army, known as the SPLA, gained semi-autonomous control over Southern Sudan, which was promised a plebiscite on whether to form an independent nation. SPLA spokesman Lieutenant-General Kuol Deim Kuol said in June that Southern Sudan planned to have an air force before the referendum. He denied these plans would violate the cease-fire agreement, pointing to capacity-building and technical training services the U.S. and U.K. governments are providing the SPLA. Under the accord, both sides were required to stop the “replenishment of ammunition, weapons and other lethal or military equipment.” The cease-fire zone specified in the deal covers all of Southern Sudan and some of the north. The accord allows for the “re-supply” of “lethal items” if approved by a Joint Defense Board, or JDB, in coordination with the United Nations Mission in Sudan. “Research conducted by the Small Arms Survey has shown that in practice the JDB does not appear to play any role in scrutinizing their acquisitions,” said Claire McEvoy, project manager on Sudan at the Geneva-based research group. Both sides have actively re-armed, in contravention of their cease-fire commitments, according to a 2009 report by the survey. The helicopters ordered by the government of Southern Sudan are MI-17s manufactured by Kazan Helicopters of Russia, a copy of the agreement between Kazan and the government of Southern Sudan obtained by Bloomberg shows. The aircraft are an upgraded version of a model first used in Russia’s 1979 invasion of Afghanistan. The purchase of the helicopters comes after IHS Jane’s, the Englewood, Colorado-based research group, last year reported Southern Sudan acquired 100 Russian-built T-72 tanks and other artillery. Sudan is sub-Saharan Africa’s third-biggest producer of oil and most of its daily production of 490,000 barrels is pumped in Southern Sudan. The crude is exported through a pipeline that runs north through Sudan to Port Sudan on the Red Sea. No agreement has been reached between the two sides on a revenue- sharing arrangement or pipeline-usage fees following the referendum. Most of Sudan’s oil is shipped to China. When contacted on Aug. 29, Kuol wouldn’t comment on the MI- 17 purchases and hung up. He didn’t answer several subsequent calls to his mobile phone. Calls to Kazan’s head office didn’t connect when Bloomberg called and the company didn’t immediately respond to an e-mailed request for comment. The first batch of the helicopters was scheduled to arrive in Uganda, which neighbors Southern Sudan, in May 2010, according to a March 2009 supplement to a contract dated May 2007. A copy of the agreement between Kazan and the government of Southern Sudan, represented by SPLA Chief of Staff James Hoth Mai, was obtained by Bloomberg. The first four helicopters were later scheduled to be flown from Kazan airport to Entebbe in Uganda on Aug. 12 aboard an Antonov AN-124 aircraft, according to correspondence between the parties. Southern Sudan government spokesman Barnaba Marial Benjamin said no helicopters had been delivered to the region. To contact the reporter on this story: Alan Boswell in Juba via Johannesburg at pmrichardson@bloomberg.net.